Even older toddlers can glue Q-Tips, you don't need to cut the Q-tips to make snowflakes, but if you want to make different sizes you could always cut them ahead of time. Put some glue in a shallow dish so your toddler(s) can just dip the swab. 1. Cut your Q-Tips in various sizes or, just use them whole for younger children. Use them to create beautiful snowflakes on your blue paper. Glue all of your Q-Tips in place and you're finished! Remember, no two snowflakes look alike! 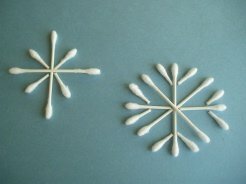 Click here to find more Winter Crafts like the Q-Tip Snowflakes!